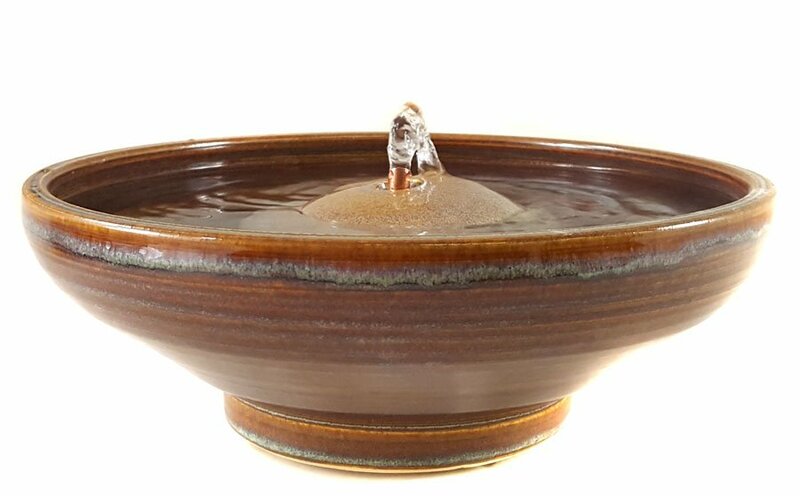 A cat fountain glazed in Desert Dawn showing a rich blend of varied hues. All our cat water fountains come with everything you need but you can add any of our cat taps if you wish a stream as well, and easily swap it in and out with the straight copper spout. All are antimicrobial. 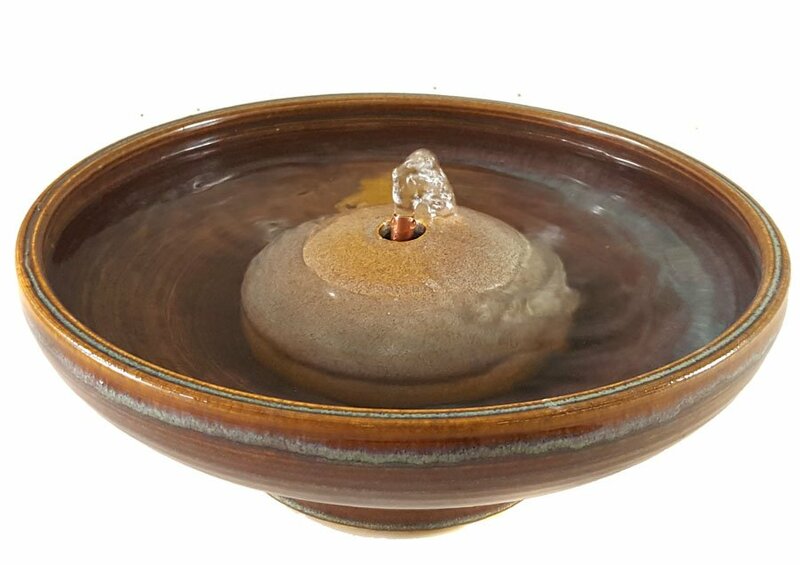 This fountain can take any of the Cat Taps and the Serenity Flow for which see those listings. It does not take the copper Waterleaf. * 3.75 inches high and 10 inches in diameter. Can be adapted for overseas use. Click here to select an overseas pump. Each cat water fountain is handmade of the highest quality stoneware, one at a time and are one of a kind. We make our own glazes from raw, pure minerals so we know exactly and how much of what is in them and can insure that they are food safe. Food safe is not simply a matter of containing no lead. If too much of any colorant is used or if any of the several toxic colorants are used the piece will not be food safe. If a ceramicist doesn’t know what is in his glazes he has no way of knowing if they are food safe. We guarantee each cat drinking fountain to be completely food-safe. In addition they are extremely easy to clean, as many of the reviews testify to. Concerning our use of copper: None of the fountains require copper to run well and beautifully, however we recommend the use of copper and provide it with the majority of fountains because it is a natural antimicrobial. 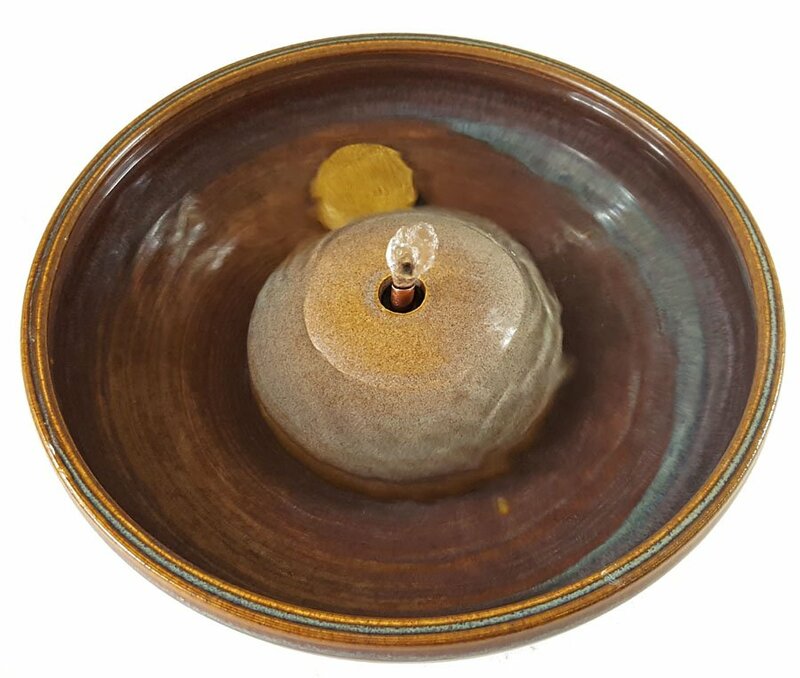 All our ‘Bubble-up‘ – cat fountain designs have a short, straight copper tube but they all run equally as well without it, using only the food-safe vinyl that is included with each. Most of the Stream cat drinking fountains do not have a copper component but one can be added to most at no extra charge.